Waking up to a big sloppy kiss from a pet is a great way to start the day but sometimes doggy breath can leave you gasping for air. Parsley and mint are natural, dog-friendly breath freshening herbs.. We’ve picked some of our favourite recipes for home-made treats that will keep your four legged friend minty fresh. Darla Magee-Price, a student at The Culinary Institute of America, shares her recipe for Frank’s Breath Brushes on her blog, Darla Cooks. Preheat over to 200C. Line baking sheet with parchment. Combine charcoal with 3 1/2 cups brown rice flour set aside. Put parsley, mint, oil and 1/4 cup of broth or water into food processor. Process until very chopped, like pesto. Add 3-4 droppers full of chlorophyll. Pulse a few times to mix. Add this green paste to flour mixture and mix well. Beat egg lightly and mix in. Knead adding remainder of water/broth. By this time you should have a very sticky dough ball. Heavily flour the work surface and knead dough until an even green colour. Divide dough into workable portions and roll out to about 1/4 inch thick, or whatever thickness you prefer. Add flour to work surface and dough surface as needed to take away stickiness as you work. Cut out with your favourite shapes (Darla uses a toothbrush shape!) and dock with a fork to keep puffiness down. Bake for 20-25 minutes. Cool and store in an airtight container in the fridge. Brendan the Beagle has one weakness. Food. When you see his adorable face on The Kitchn website, you can understand why Coco Morante developed this recipe. Visit TheKitchn.com for Coco’s step-by-step instructions with photos for her Breath-Freshening Dog Treats. It’s no secret, The Cookie Rookie loves her dog Scout more than anything. Even cookies! 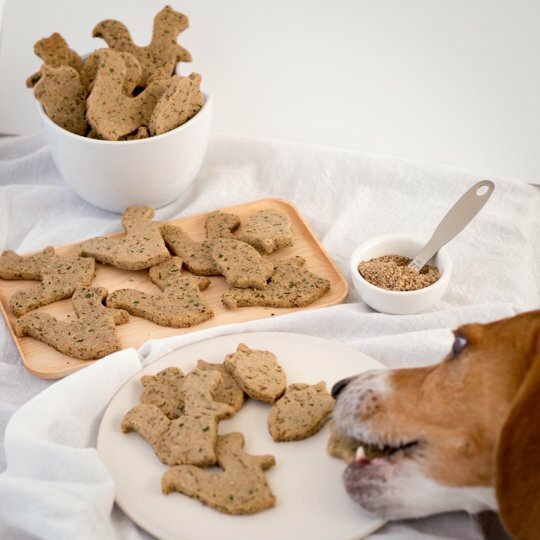 We suggest adding mint, parsley or even dill to her delicious Peanut Butter Dog Treats to combat dog breath. Visit her blog for lots of adorable photos of Scout throughout the recipe. 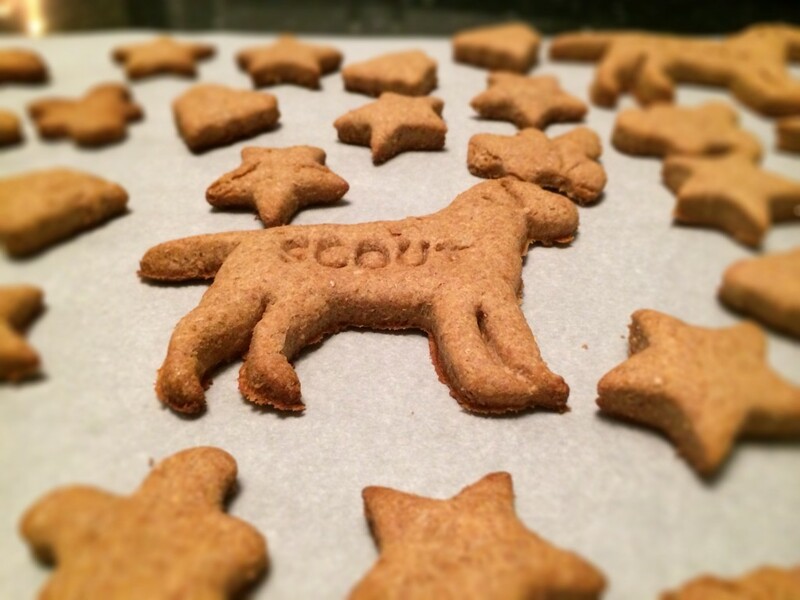 The Cookie Rookie’s personalised treats for her dog Scout. What a lucky boy! ***NOTE: some dogs are allergic to flour/wheat. if you want to make these wheat free, you can use rice flour or coconut flour as a replacement. They will work, but might change the consistency a bit. Thanks so much to the readers who wrote it about this! In a large bowl combine flour, baking powder and the egg. Add peanut butter, water, honey and stir until you have stiff dough. The dough becomes very firm and sticky, you may need to use your hands, or the paddle attachment on your mixer. Keep in an airtight container or give as gifts!